Nearly 50,000 thirsty attendees decend upon downtown Denver each year for the Great American Beer Festival, making it the largest beer fest in the country. Over 3,100 beers from 624 breweries were available to sample this past weekend, all while a busy crew of 201 beer judges (tough gig, right?) evaluated and ranked 4,809 beers broken up into 138 categories of beer styles. Southern California’s breweries have garnered some serious bling in the past, raking in a respectable number of gold, silver, and bronze medals. And while San Diego has represented a large number of those wins, Orange County and Los Angeles breweries are really starting to represent. This year, I expected to have a few breweries to write about, but had no idea L.A. would get this much love. Our big winner was Julian Shrago and his crew at Beachwood BBQ & Brewing from Long Beach. Shrago’s team brought home an impressive five medals. They were also named Mid-Size Brewpub and Mid-Size Brewpub Brewer of the Year. It’s worth noting that Beachwood earned two medals last year: a bronze for El Verano in the French- and Belgian-style Farmhouse Ale category and a gold for Udder Love. If you haven’t been to Beachwood BBQ (either the standalone restaurant in Seal Beach or the brewery/restaurant in Long Beach) or tried any of their beers, perhaps now would be a good time to change that. Kinetic Brewing Company in Lancaster was also on the winning end of two awards, taking home a bronze for their Potential Blonde in the German-style Kölsch category and another bronze for Torque in the Session Beer category. Other GABF medal winners just outside of L.A. county include a gold medal for Winter Warmer from Hangar 24 Brewing Company in Redlands, and a pair of bronze medals for Schwarzbier and Helles lager from TAPS Fish House & Brewery in Brea and Corona. Paso Robles-based Firestone Walker Brewing Company—which recently announced that it will be opening an outpost in Venice—clinched three gold medals: Pivo Pils (German-style Pilsner), Taproom IPA (English-style India Pale Ale), Wookey Jack (Black IPA); and a silver for their Union Jack (American-style IPA). These wins also earned them the prestigious title of Mid-Size Brewery of the Year for an unprecedented fourth time. Several local favorites, including Eagle Rock Brewery and Anaheim’s Noble Ale Works, were noticeably absent from this year’s GABF as there simply weren’t enough open spaces for every brewery that wished to attend. The Brewers Association, the industry group that puts on the Great American Beer Festival each year, is working to address the record number of potential entrants that were locked out of the competition and will be making adjustments for future years. They plan to add approximately 30% more space to the event by 2015. 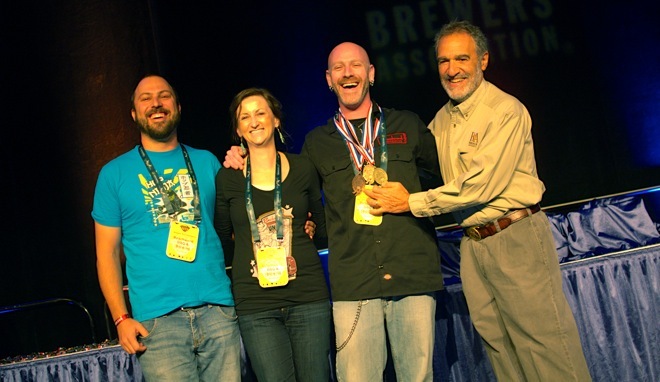 View all 2013 Great American Beer Festival winners.